EDIT: Giveaway is officially over. Congratulations to Aleka Nikolaidou for submitting the randomly-chosen 811th entry. Pack a second breakfast and join the hobbits in a glimmering journey of epic proportions. Only one shall be chosen to win a $25 gift card to Shealynn's Faerie Shoppe. But remember, short cuts make long delays, so don't even think about trying to cheat the contest. While wearing Shaylynn's (no, the missing e is not a typo; her shop is named with old Irish spellings) fantasy jewelry like the copper torc necklace above, one might be tempted to call it "my precious." When she couldn't find any affordable Elvish jewelry for an Arwen from The Lord of the Rings costume at age 13, her mom bought her some supplies to make her own. She has been designing jewelry inspired by fairytales ever since. If you can't resist the power of Shaylynn's designs, don't fear. 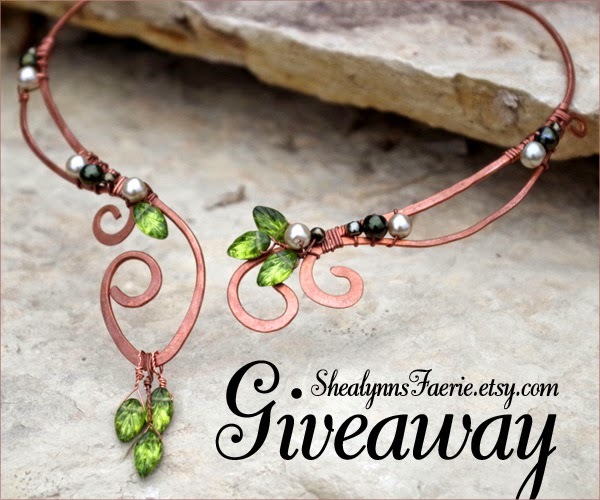 You don't have to win her giveaway to possess a piece of handmade jewelry for free. Every blog reader of mine that purchases from her Etsy shop before August 10, 2014 may claim one, and only one, free gift to the right. Simply type the magic words "AquLeaf2014" for Czech glass leaf drop earrings or "AquRose2014" for a rosette ring in the Notes to Seller box during checkout. The color will arrive as a surprise, depending on which way the West Wind goes walking. Use the Rafflecopter below to enter to win worldwide giveaway before 11:59pm EST on August 5, 2014. Be sure to leave the mandatory comment on the blog post with the same name you use to fill out the Rafflecopter - all entries by winner must be easily verified or a new winner will be chosen. Not including usernames when asked will also get you disqualified. I love the not all who wander are lost in Elvish bracelet! I love her copper stuff, especially the Elvish bracelet and the Okay necklace. Also her hair forks and the Doctor Who stamped set... There are so many lovely things in the shop! For the Pinterest ones, I'm not sure if I put in the right username... Was it supposed to be the name or the username after the URL for our Pinterest pages? The Elvish Copper Torc Necklace (https://www.etsy.com/listing/192456649/elvish-copper-torc-necklace?ref=listing-15) is amazing!! I adore the Something Blue Princess Aurora Cuff! Entwife Forest Fairytale Circlet is absolutely gorgeous! Purple Enchanted Evenstar would be my favorite. Thanks for the chance to win!! I like many different things!!! One is the: Princess Aurora Vine Necklaces (2)-- Pearl and Rhinestone. I honestly wish I could pick a favourite but omg they're all so gorgeous! I lovelovelove your pieces; they're incredible! Fantastic shop! I'd have to say my favorite item is the purple celtic braided bracelet. i love the queen guinevere circlet! thanks so much for the wonderful giveaway- i'm glad to know about this shop! https://www.etsy.com/listing/192440177/blue-celtic-spiral-hair-pin-fork?ref=related-5 Beautiful work, and the 1st time I saw any Warehouse 13 fandom items-very cool! I LOVE the Elvish Not All Those Who Wander Are Lost Copper Bracelet!! My very favorite is the Illusion Flower Necklace -- Green and Pink! I like the rhinestone, pearl and garnet bangle! I love the Elvish Copper Torc Necklace. Hello! Such a lovely shop! One of my favorite items is the Something Blue Princess Aurora Cuff. So pretty. Thank-you for the fun chance! I Really like the Rosette rings and the red pixie earrings. Wow, everything is SO beautiful it was hard to just pick one! But the one on the top of my list would be the blue dragonscale earrings. I absolutely love the colors! Thank you for this opportunity. I love the peacock earrings! That and the red and gold guitar string bangle. Beautiful! Thank you for the chance! I love the Entwife Forest Fairytale Circlet, it is sooooo beautiful!!!!! I've been friends with Shaylynn for years now, but some of my favorites are relatively new pieces--I'm so in love with her copper torc necklaces. love the Seafoam Bauble Chainmaille Earrings! So many gorgeous things! I especially like the Purple Enchanted Evenstar necklace. I like the princess aurora vine necklaces! I love the color of the Mint Chainmaille Flower Bracelet. I like the Classic Chainmaille Byzantine Bracelet - Cheryl R.
I love the Princess Aurora Vine Necklaces (2)-- Pearl and Rhinestone. So pretty! I like the Fairytale Flower Cuff, and it's only $10!! too many lovely pieces but my fav would be the Arwen LOTR Quote Elven Necklace and Cuff. I like the Elven Flower Copper Bracelet. The mischief managed bracelet is to die for! I love the Fairyland Forest Necklace. So pretty and unique. Love the FairyLand Forest Necklace- so pretty! I love the Fairy Garland Vine Necklace! All of these pieces are just my style, so pretty! I like the Classic Chainmaille Byzantine Bracelet . There are many more great pieces too! I love the Rhinestone Silver Rosette Ring. I like the Autumn Red Flower Spray Hair Clip! I like the Minimalist Beaded Blue Necklace. I like the Made to Order Fairy Sandals and the Princess Aurora Vine Necklaces!! I like the Black Lock and Key Necklace. I love the Elven Silver Leaf Vine Cuff for my daughter. She would love it. Oh I LOVE the Eleven Flower Copper Bracelet!! Beautiful products, favorite is the Fairytale Flower Cuff. I like the Bold Fantasy Swirl Copper bracelet the most. This is an awesome necklace in the picture, love it! I like the jewelry presented here. I especially loved the Elvish Copper Torc Necklace a lot and would love to add it to my jewelry collection. I like the Illusion Flower Necklace. I like the Custom Art Nouveau Grecian Copper Headband. LOVE the Autumn Wire Tree Necklace! Thanks for the chance to win. I love the Bluebell Chainmaille Flower Bracelet! I LOVE the Fairy Garland Vine Necklace! I like the Fairytale Flower Cuff! What a wonderful shop! I really like the Autumn Wire Tree Necklace. I love the Fairytale Flower Cuff! My favorite is the Autumn Wire Tree Necklace. the Elven Silver Leaf Vine Cuff! Current favorite is the fairy garland vine necklace. The fairy garland vine necklace is yushie. The Real Leaf Elven Necklace is so pretty! 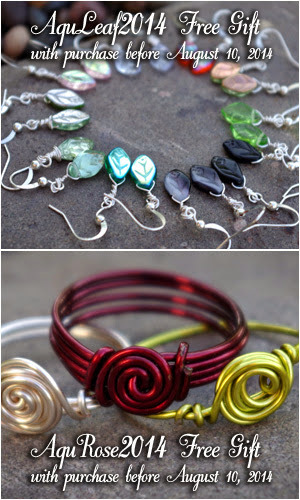 The upcycled guitar string beaded bangles are my favorite!! My favorite item from her shop is the lovely Aurora's Fairytale Rhinestone Headpiece. i really love the Mischief Managed Gryffindor Bracelet! I really like the Silver Vine Ear Cuff Earring Set. I love everything but fell in love with the wire tree necklace! I love the Mischief Managed Gryffindor Bracelet! I am a huge Harry Potter fan! I love the Elven Flower Copper Bracelet.Gorgeous! Awesome giveaway, I love the earrings theyre beautiful! I am in love with the Fairy Garland Vine Necklace! I like the Sterling, Blue, and Green Ombre Chainmaille Slender Bracelet. Ohmygosh the Celtic rustic copper cuff is to die for! I really like the Purple Enchanted Evenstar. Oh wow I really have to pick one!? There are so many I like. My favorite would have to be the hair clips :) I can't pick just one though lol. I love the Sterling, Blue, and Green Ombre Chainmaille Slender Bracelet! I love the Entwife Forest Fairytale Circlet! I like her Elegant Pearl Cross Necklace! Love the Fairy Garland Vine Necklace! It's amazing!